These are chock full of super foods to provide your body and mind with long-lasting energy to get through your busy (or leisurely) day. What have they got? Chia seeds, flax seeds, hemp seeds, pumpkin seeds, walnuts, cacao nibs, raisins, dates and coconut. You can't beat this recipe as far as nutrition goes. Try to find organic varieties of each ingredient - and of course raw! I was snacking on the mix as I made the recipe and immediately felt a difference, they gave me enough strength to get through a workout and then they made an excellent post-exercise snack, paired with my green protein smoothie. I had a bit of extra mix that I shaped into tiny cupcakes and I thought... hey, I could top these off with dark chocolate to make it a sweet super food treat. Done. Throw the dry ingredients (keep a little bit of each ingredient to add in a second) in your food processor, then add the dates and raisins and process until everything it starts to stick together. If too dry, add more dates or coconut oil. Put in the remaining dry ingredients you left out and mix in with your hands. Press into a lined pan and set in the fridge for an hour or more. Cut into bars and store for up to one week. If you have extra, shape them into cupcakes and top off with raw chocolate. Yum ! they look perfect, I love snack like these, full of good stuff on the go...I would love one bar for my next class! I love these! I made them into balls instead. Do you know what the nutritional information is for these? I have a question. How long are they good for if kept in the fridge ? Looks delish! Problem is i can't stop eating them. Even though it's all really good for you... Should I eat all 15 bars of energy bars over several hours? I guess that's better than eating 15 bars with ingredients I can't pronounce. All your recipes are REALLY simple and yummy. I <3 your blog! Your blog is the only blog that I religiously check regularly. I wish they sold this kind of food in shops! Haha too true! I think I have some raw bars out there though... in health food stores, etc. I really enjoy reading your blog, and am always excited to see your new recipes. The trouble I come across nearly every time I read a recipe from a person who advocates the raw vegan diet and lifestyle is the heavy dose of haterade. I whole heartedly agree with your sentiment that "energy" bars are anything but that, providing a space age stew of all that is processed to individual components and reconstituted, and that this extends into the far reaches of nearly any "food" product. However, having to navigate the seething remarks (yours not being nearly as concentrated as they come) sheds a light of fear and aggression on raw veganism. In my experience, this underlying message (along with misinformation) is enough to unearth feelings of disdain. If individuals who chose to speak out about raw veganism spoke from a reference of earthly beauty and power, rather than lashing out at whatever scientists these days are considering edible, people would approach the concept with joy and excitement for what is to come instead of shame for what they might have already thought or eaten. All that being said, I always look forward to see your latest creation, as they are beautiful and delicious creations. How do you make the raw chocolate? These look amazing and I love your photos. And can I use cacao powder instead of cacao nibs for this recipe? Oh I forgot to link the recipe! Thanks for noticing, Christina. Like always these looks divine!!! What I notice I have all of the ingredients. have to make a try!!! Woo! That's always the best realization. Emily, we have a severe nut allergy in our house, and I'm on a diet that doesn't allow grapes at the moment (high-maintenance, I know), so I subbed sunflower seeds for the walnuts and figs for the raisins. I ended up adding the coconut oil, and while they pressed together, they didn't stay together - crumbled apart (and I'm now adding that mix to smoothies). Could it be that the walnuts and/or the figs don't have enough moisture? They're a hit with our 5.5 year old, though, who helped make them. She just ate it with a spoon this morning. Oh no! Is there a reason you can't use dates? They would work well to combine the ingredients, along with the coconut oil. Smart using sunflower seeds instead =) and I am glad your little one liked it anyway! I actually did - I used dates + figs, just subbing the figs for the raisins. Also realized I didn't use all of the oil - just 2tsp, vice 1-2T, so maybe that's it. May also try to use unsweetened cranberries or dried cherries, as she loves them both. Also, maybe I missed it in the recipe, but it might help with getting the "press out" part right if you added a size of pan. I'm SO looking forward to having one of these tomorrow, btw! I just made these today. They are delicious, healthy and simple to make. Thank you! These look amazing! Do you store them in the fridge? Or can you keep them in the pantry? These look amazeballs. I'm about to whip them up now. I don't have any hemp seeds but I'm sure I'll find something to sub them with. I added in some sunflower seeds and some raw cacao. I can't wait for them to set!!! LOL thank you :D I would've added sunflower seeds if I had had any! As far as dates... honestly don't worry about eating too many, pair them with other fruits to get a filling meal. If they are in my recipes, you also won't be eating too many. In short: if you are making my recipes, eat one serving per day and you are NOT overeating. In fact, you are getting your necessary nutritional requirements for several vitamins, nutrients and minerals =) Just don't eat any other nuts on the same day, because you got your intake in the recipe. Make sense? thankyou so much :) it makes a lot of sense! puts a lot into perspective for me:) and lifts a weight off my shoulders so I can just enjoy what im putting into my body. Great to hear =) Good luck, stay in touch please! Can I substitute anything for the coconut oil? Can I omit it? I don't have any and wanted to whip these up for tomorrow. Any suggestions? Hi there, I want to ask, can I add intead cacao nibs cacao powder? Hi again, I tried to make this energy bars, the taste was delicious but the mass I got was dry, a part got freezed in the fridge (I put them for all the night). When I was making bars some bars were crumbling, so what did I wrong? Okey, next time I'll do that, because all products I divided over half, that's why I think I got little bit too dry mass. I made them used fresh hard coconut and two TBS of Cocoa... ohh my God! my husband wants me to make it every day..
Hi I just want to say all your recipies look amazing! Do you use fresh dates or dried dates in this recipie? I have tried to process dried dates in my food processor before and It didnt really work. Hmm, they should be dried but still gooey and and easy to pull apart. These look divine! I want to make them and give them as a gift. How long will they keep? Mmmm, these I must try. I've been looking for a great bar to grab on the go, to keep as a snack at work, or post workout. I'm thinkin a little sprinkle of sea salt on top of those cacao ones would be amazing! Thank you! I'm also curious what type of camera you use? I'm looking to get one, and these are some lovely shots! Just wanted to tell you how delicious this recipe is. I decided to make mine into balls...the recipe made 16 balls the size of a meatball. I had everything in the pantry so it was a no brainer to make! Thanks. I cannot find hemp seeds anywhere and I dont know what cacao nibs are...please help! Uh oh! You can use more of the other seeds instead of hemp. Cacao nibs are simple chunks of the cacao bean. Hoi Emily, your side inspires me A LOT, all ingredients and pictures make me very happy! Just made these bars, they're in the fridge right now - can hardly wait! Just curious, what do you mean when you say a "lined" pan. I noticed this in a few recipes but I am not sure what that means. lined with what? Great stuff! Made them today! Thanks! Thanks for this recipe. 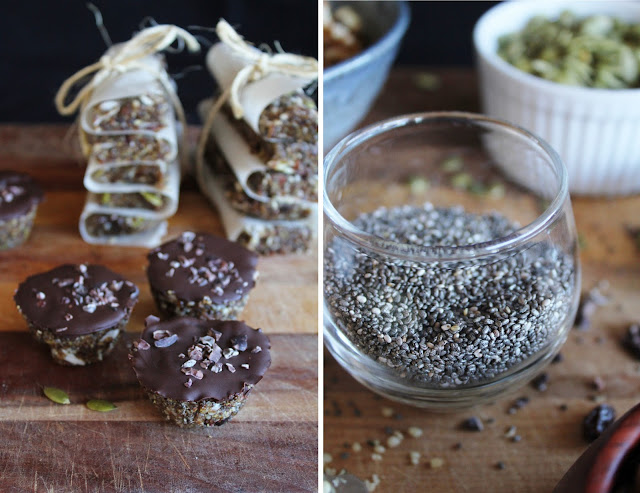 I made the chocolate using dates rather than other sweet stuff and used sesame as I had no hemp seeds (not sure where to get them here - haven't looked really). Just chopped them into about 80 small squares.....the off cuts were awesome. I made these again tonight, made them on Sunday and my husband and I love them. They give us so much energy! I bought my dates at Whole Foods, organic, do you buy yours in bulk? I have to drive 3 hours round trip to Whole Foods and Trader Joes so I am hoping to find a good bulk place online that sells organic ones. A lot of your recipes use dates so I need to stock up :) Dates are So good also, I hadn't had any for years until the other day. Hi! I do buy nuts and oats in bulk, and sometimes dates as well. I use Upaya Naturals (for Canada) :) You can go on their website to check out their products. But nonetheless <3 i'm in love with this recipe. Don't use those (they don't harden at room temperature). Add more dates and you should be okay. This is great for my break time.I'm goin' to make this one later.Thank you so much for sharing this stuff. could i leave the nuts whole if i sub almonds for walnuts? will they still stick together? Chop them as finely as you can and I think it will be okay... but leaving them whole will probably not work. Can I ask why you asked? Substituted coconut oil for peanut butter and it's delicious...! What's the calorie count on these (approximate)? I'm trying to shed some pounds and am always searching for foods that will fill the tank and keep me energized. I know some protein bars can have 400+ calories. Just wondering if this is a healthy, energizing snack option, or a meal replacement. Thanks. If you only have a small bar that fits in your hand it's probably around 200 calories, if you have enough to make you full, then it's a meal :) I don't count calories myself so I can't give you a number though. I love these! I skipped the raisins and added raw sunflower seeds. Everyone who has tried them, thought they were great. I even dressed some up in brown paper and twine and gifted them to a friend. I live in a large country that measures distance by days of travel. I've spent quite a bit of time on the road in recent weeks and these have really saved me. A crumbled bar in yogurt makes a perfect breakfast. I keep a bar in my purse, so if I am out and miss a meal, I have a safe and satisfying snack. All I really need with it is water. Thanks for a satisfying, healthy option, especially for travel! These look so good. Could you tell me if you use whole hemp seeds or just the hearts? I just bought whole ones for the first time. They're so much less expensive the the hulled ones. Do you think it would matter for this recipe? Hello!! I have to tell you your website SO inspires me!!! I grew up vegetarian and have been vegan for a year... I haven't had recipes to really excite me since my recent conversion until I found your website. I'm an artist so your pictures and recipes are satisfying on soooo many levels :) I hope you see my other recent comments about the other things I've made from your site... I'm making at least one of your recipes per week! I LOVE this one!! I seriously get a body buzz eating a half bar~ it's insane and it tastes soo good!! I am sweet addict, couple of times I tried gave up sweets and it worked for sometime, until I was deciding to eat a little bit again and it never worked. I tried to switch to eating dried fruits or honey, but I was always getting tired of the same taste... until I found your blog (actually one friend showed it to me). And I now I am saved. I can eat sweets and instead doing bad to me, they will do good to me and I can eat as much as want and not to get bored. Simply perfectly awesome! :) thank you a lot! Unsure if anyone has asked this question, but is there a nutritional difference between cocoa and cacao powder? I am interested in ordering raw cacao powder online, but I want to know if it is actually necessary. Thanks! And keep up the great work! I didn't have any hemp or chia but I made them anyway! Broke our old 300W hand blender in the process, switched to a bigger food processor and they've turned out great! These look awesome, do you think they would store longer than a week if vacuum packed and frozen? Oh definitely - they'd store for ages! Can you replace the dates with figs? I made a batch of these last week and pushed dark chocolate covered cocoa nibs into the top. They are ingenious and they are fabulous! Thank you!! Thank you for this wonderful recipe... I am so happy I found your blog !!! These are so delicious and healthy. All my extended family and runner friends are enjoying making them too now! Thank you so much for all you do! These look so delicious! Can you freeze them? Hi Emily, I have just made these and they are truly delicious. As per Theodora, just wondering what your thoughts were regarding freezing them? Great recipe! Any tips for chopping up dates? I have a hard time with it using my small blender and food processor. They are just too sticky. Also is there an alternative binder for this? Oh weird... No tips from me, sorry! I've never had that problem. You mean instead of coconut oil? Cacao butter or cocoa butter would work. Hello made these using the measurements etc and coconut oil but they are very crumbly can I remix and add something else to make them "stick" together more? I did chill in the fridge, perhaps a smaller pan. What would work now? Have spare coconut oil plus the raw chocolate which has not set either, ideas please. Thank you, writing from New Zealand. Totally loved the sushi with beansprouts fed the office for lunch yesterday. A very tasty combination. Thanks for putting up your ideas. Will keep eating them!! Yum. Just made these to take with us skiing. Don't know if they'll make it up the mountain. Ok just made these. Yummy!!! I did add a tsp of cinnamon - it's Christmas time, a tsp of maca for minerals and cayenne just to add a little kick. So easy to make, took me minutes. Thanks for sharing. Perfect for kids too. How long does these last for? A MORE restricted raw diet? What can you eat? Any dried fruit will do... you just need something sweet and sticky to hold it all together. Do we know calorie content? This looks amazing! No sugar, no carbs, all raw. I am so gonna make this! Thanks for the recipe! Mmm!! These do look great. I made energy balls just like these but didn't add flax seeds because I don't have a coffee grinder to grind them and since we can't digest flax seeds I left them out, but they sure do have lots of health benefits! Your pictures look amazing. Great job on this post!! I don't eat raw, I don't even eat vegan, but I am trying to add healthy food to my life and this is definitely staying, because I love these, they are incredibly yummy!!! The So Delicious definitely has a energy bars with cacao.I like it better than any of the other nog’s I’ve tried but if someone doesn’t like coconut they might not like it. These came out great but if I would suggest grinding the flax and chia seeds before putting them in the food processor. Hmmm next time try processing the ingredients more, so you end up with a finer consistency; that way it will hold together better. Hi Emily! These look like great snacks while I work (pretty intensive manual labor type of gig)... anyway, all I have is a cheap blender and no food processor yet. I am looking to spring for the upgrade... any recommendations? I have one from KitchenAid and it works very well. Apparently CuisinArt is also an excellent choice. Cheers! 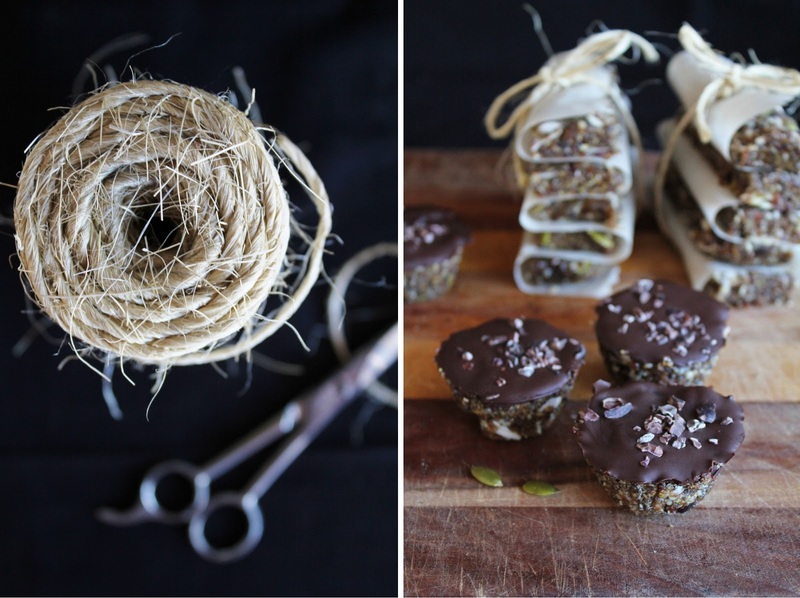 I made these last night with the raw chocolate on top- absolutely delicious! I had some chocolate leftover which I spread onto baking paper and put in the fridge. Although it is really tasty it didn't quite harden...any guess as to why? Thanks for the great recipe and awesome blog! Any Idea how many calories would be in one bar? Not sure, I don't count 'em buuut it'd be quite reasonable. Maybe 100? Your blog is beautiful. I made these bars but they didn't really stick together very well, even though I did use a couple of tbs. 's of coconut oil and a few extra dates. Do I just keep adding more and more of those until I get them to stick together or am I maybe doing something wrong? Great recipe for anyone's diet! They came out so yummy! Hi there Emily! So happy to have found your blog a month into my Vegan adventure. I made this recipe 3 times,,each time adding more and more dates and coconut oil until I got to the point that I had two cups of dates and two heaping tablespoons of coconut oil. The bars were still very crumbly and by the time my fiance transported them to work they were all crumbs. ;( I read in your comments that someone added maple syrup.. and as much as I hate to modify your recipe, it worked! I know its not ideal, especially because of the additional calories..but I just found it was the only thing that worked. If you can suggest anything else I will be open to trying it. Regardless, thank you for all of the time and effort you put into these beautiful recipes!! My wife, 3year old and I loved the bars, thanks! How long will they last kept out? In frig? In freezer? @Garrick - thanks! They will keep for a couple weeks in the fridge, and a couple months in the freezer :) They'll still be edible after that, but they taste best consumed before. i can't wait to try these. Emily what can i use instead of oil? @jeff - I used a 9X4 pan :) And you can use more dates or raisins to keep 'em gooey! Yummy! So going to try these next week! I have a question though, I'm newly vegan (from easter this year) and I've heard a lot of mixed information about agave nectar and it's positives and negatives. I was wondering what your opinion on the use of agave in recipes is? Is there something better to use? P.s I LOVE all of your amazingly blissful creations! @Ayisha Miller - now I do not use Agave, I usually use maple syrup, coconut nectar or date paste. Honestly since you are having it in such small amounts I can't imagine it would have any kind of substantial impact. But at this point people are favouring coconut nectar for the health benefits. Maple syrup is more affordable though, and is still fairly nutritious. Date paste is definitely the most whole foodsy, but it doesn't have the same texture. t say: see how the food makes you feel! I love it. Have been using this recipe, and these bars as a snack between meals for two months now, and i can feel big changes. I have more energy, better concentration and the list is endless. Thank you for sharing this super bar! so I just finished making these and stored them in the fridge for 2 hours. I followed the directions EXACTLY and even added 2 Tbl spoons of coconut oil. They are delicious but they are falling apart and not sticking together like a solid bar. I mean they are in bars, just as soon as you take a bite they start to crumble... any suggestions? I have just discovered raw food and your blog...your blog is beautiful. Anyway, probably a stupid question - dates...do you use a certain type? Medjool? Or dried ones? Or does it not matter. @Sarah Mac - medjool is what I usually use, but any kind will work. These were delicious! Do you happen to have the nutrition information for this recipe? Based on my calculations, the entire batch 4,834 calories. I cut it into 6 portions, which is 806 calories per serving. That's a lot for one breakfast. Even cut in half, that's still way more than I currently eat for breakfast. I was wondering if (hoping) my calculations are off. @TJ Bailey - They aren't low calorie by any means, because I don't believe in counting calories or keeping calories low. I believe in eating whole foods and nutrients that my body needs. Having said that, this recipe can make way more than six servings; more like 10. You don't need much because they are dense. I'd have it with oatmeal or a green smoothie and fruit bowl. I can’t wait to try these. I’m going to have to dig out my “fat pants”! I make these now Every week. We all love them in our house. We also travelled to barbados so I packed a lunch for the flight. This was my lunch. :)...It was great. Those meals in the air are not friendly to me and I was happy to have my homemade bars with me. Thank you. I love your site. Your pictures and the recipes. Amazing! I'm sooooo happy I discovered you! My life is so much testier now. Just have a question: when you ask for hemp seeds do you mean hulled or whole? Many recipes (not only yours) ask for hemp seeds and I'm always confused about hulled/unhulled. Hi Emily, should I use shelled or un-shelled hemp seeds please? How do you know who will be a good site for your personal trainer of health nutrition or health tips? I have never needed the services of one as of yet, but I have always been curious what makes a good about my health and fitness.I would say about my topics. 1. What are cacao nibs? What do they look like? Where do you buy them? 2. Could you substitute carob chips? And why don't you used them in this recipe instead of the cacao nibs? 3. What is raw chocolate? Does it contain sugar? Right up my alley, I eat this type of thing all the time. Great as they are, I'm sure, but topping with dark chocolate certainly amps them up a bit! Hi, I have made these a few times and they always fall apart when I eat them. Mine are normally less than 1/2 inch thick. Am I making them too thin or do I need to add something to keep them sticking together? Thanks! Do you soak & dehydrate the nuts ? I love this recipe, and it has become a go-to for us. I've seen several comments about the mix being pretty dry and not wanting to stick together. Your suggestion to add more dates is good. I would also add that I heat the dates (with water) so it's more like a date filling. That seems to help bind the rest of the ingredients. It's an extra step, but worth it. Yes my latest batch won't stick together so I will reprocess it with more dates.. Next time I will make date paste . 1 cup dates - used 1/3 cup coconut sugar and it was sweet enough and no issues with bars not sticking together! - mixed all in Vitamix; kept some aside and then decided to add all in Vitamix vs mixing by hand; pressed in 2 bread loaf pans, thin layer, lined with parchment paper. Left in freezer for approx 15 minutes, cut in small squares; wrapped in parchment paper+ziploc bag, I store in freezer for a quick for a quick Energy bar on the go!